The lanthanoid series are lightest elements with 4f orbital electrons, where the outer electron configuration for the lanthanoid(III) ions is the same. This results in predictable chemical behaviour along the series of the lanthanoid(III) ions due to their decreasing ionic radius, the so-called lantha-noid contraction. However, there are sub-structures in their chemical behaviour, which make it possible to group the lanthanoid(III) ions into four tetrads when plotting the logarithm of certain physical chemical parameters versus atomic number through the use of four smooth curves. This phenomenon is often called “the tetrad effect” and can be explained by the stabilization energy related to the inter-electron repulsion energy of the 4f electrons, making the half filled 4f7 electron configuration especially stabilized. Two other breakpoints are usually located at 4f3 - 4f4 and 4f10 - 4f11. In this work the tetrad effect is exemplified by results from solvent extraction and complex formation experiments. The parameter studied is the distribution ratio of the lanthanoid(III) ions in a synergic extraction system consisting of an aqueous solution, with sodium perchlorate as ionic medium, and an organic phase containing 2,6-bis-(benzoxazolyl)-4-dodecyloxylpyridine (BODO), 2 bromodecanoic acid (HA) and tert-butyl benzene (TBB). The stability constants of the lanthano-id(III)-EDTA complexes have been used to illustrate the tetrad effect as well. The recently reported structural characterization of the hydrated lanthanoid(III) ions in aqueous solution gives an explana-tion to the behaviour along the series. In the first tetrad nine water molecules are coordinated in a regular tricapped trigonal prism. Along the series this configuration becomes more and more distor-ted, as one of the capping water molecules becomes stronger bound to the lanthanoid(III) ion than the other two, finally causing a water deficit in the capping positions in the fourth tetrad which is accentuated with decreasing ionic radius. 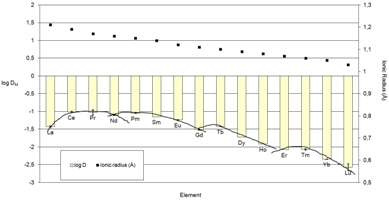 The tetrad effect can be seen as a combination electronic effects of the f electrons and structure properties of the hydrated lanthanoid(III) ions.